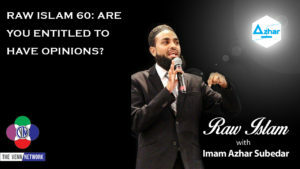 You are here: Home / Raw Islam / Raw Islam 60: Are You Entitled to Have Opinions? This week on the Raw Islam Podcast with Imam Azhar– a 2017 Podcast Award nominated podcast, the Imam asks if we are entitled to our voice and our opinions? Imam Azhar lays out four questions about personal opinions. The first question is simply if we are allowed to have them. And the answer – no big surprise – is that we are all allowed to have our opinions and our thoughts, no one should disagree with that that statement. The second question is what helps you formulate those opinions? Our opinions are often built around some kind of personal doctrine. Be it religion, or life experience, or education, or worst of all – they could come from ignorance. In these times, with everything that is going on in the United States, Muslims are being pushed to give their opinions on topics like immigration, abortion, and LGBTQ rights. The third question is simply – are we obligated to give to give voice to our opinions? If you have an opinion, does that mean that you have to share it? (Have you been on Twitter?) Or have we reached a point where we are too afraid to share our opinions for fear that we might scare or offend someone?